Hey guys! Laura here. It’s been a tumultuous couple of months dealing with unexpected medical issues, but I’m happy to say that everyone is doing much better and we’re finally back in action. Thank you all for your support during this stressful and annoying time. We hope you missed us as much as we missed you! That’s how I was feeling all day yesterday and the beginning of this morning. Tacky skin, hair frizzing up on each side of my head, sweaty clothes … yeah, it wasn’t cute. I had to do something about it, so I decided to treat myself to a frozen hot chocolate at Coastal Roasters in Tiverton, RI. I’d never been there before, but I’ve read and heard tremendous things from friends and internet reviews. Plus, I’ve driven by the place about 800 times and it was about time I pay them a visit. I stopped in at around 11 a.m.
From the picture, you can tell that I’m parked across the street. Coastal Roasters is always busy, and I was lucky to get a spot at all. I walked through the sea of people chatting at the tables and benches and stepped inside. The dining room – if you can even call it that – has seating for less than a handful of people. However, with summer coming and the coffee shop being right on the water, who would want to sit indoors? 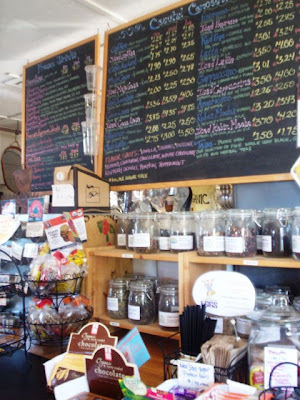 The main attraction inside the coffee shop is their large chalkboard menu of specialty drinks. They also have various pastries, muffins, and granola bars scattered around the counter. I, having never been inside before, was overwhelmed by the sign and had to take a minute to decide what I wanted. 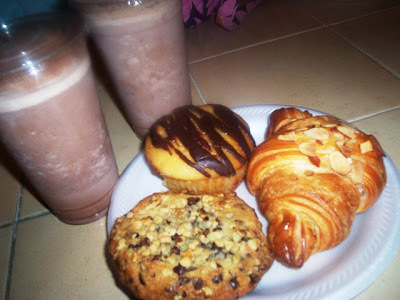 A friendly girl named Sara waited on me as I placed my order of two medium frozen hot chocolates ($4.20 each), an almond croissant, a Boston Cream muffin, and a chocolate chip cookie with walnuts. I couldn’t very well get breakfast for myself without getting something for Mom, right? I asked Sara to put some peanut butter in my hot chocolate for an extra kick. You can also add an extra shot of something or fruit (I read that the whole banana is a delicious option). It took a while for her to get everything together, but I think that she was by herself and those frozen drinks take forever to assemble. I was happy to read over the menu while I was waiting. Coastal Roasters specializes in fair trade and organic coffees. They pride themselves on the freshness of the beans they select, and sell coffees from several different regions (local signature blends, Americas, African/Arabia, Indonesia, and the Islands). They have a coffee of the month club, and if I’m not mistaken, a deck in the back where boaters can drive up and come in for a drink. Coastal Roasters does not have a large selection of pastries, but what they did have looked extraordinarily fresh and was either wrapped in plastic or stored in a small bakery case. They also have a large selection of teas, frozen drinks, lattes, and iced coffees. I could have concentrated more on the menu if the guy behind me would have stopped complaining about the blister on his foot. Pansy. My total came to $15.34. A bit on the pricey side, but if the quality is there, I don’t mind paying more for a superior product. I flew down Route 24 to ensure that the frozen hot chocolates did not become wet, melted blobs. They did not. I cut the pastries in half for Mom and I to share and we dug in right away. Everything was fantastic! The almond croissant was flaky, buttery, and had a strong almond flavor. The chocolate chip cookie with walnuts was thick and absolutely covered in chips and nuts. Finally, the Boston Cream muffin was deliciously moist, topped with a chocolate swirl, and filled with a sweet cream. I’m not sure if they bake the pastries themselves, but wherever they come from, they’re fabulous! As for the frozen hot chocolates – wow. What a tasty treat! They were thick, chocolaty, and mine had a thick peanut butter swirl that made the drink taste like a Reese’s Peanut Butter Cup. Mom’s was plain and she told me that it tasted just like a cold hot chocolate (appropriate, ha, ha). What a successful breakfast! Thank you to all of the people who have written begging us to take a trip to Coastal Roasters. A friend of mine who lives nearby stopped going to a certain coffee chain once he found this gem. You won’t be disappointed. Plus, you get to drink coffee and eat pastries outside. What’s better than that? 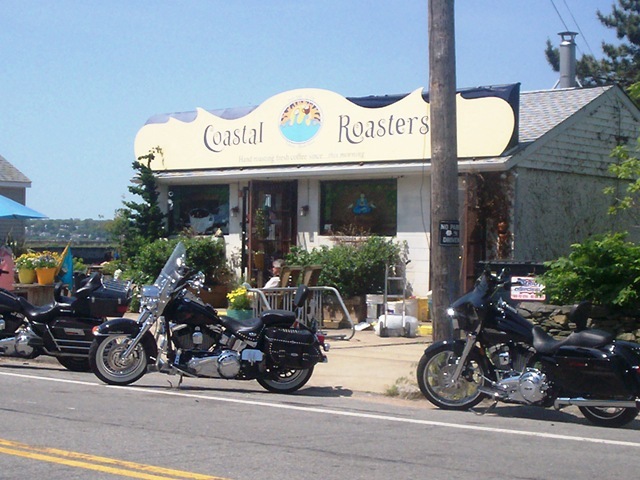 Coastal Roasters is open from 6 a.m. to 5 p.m. Monday through Friday, and 6:30 a.m. to 5 p.m. Saturday and Sunday. Please call for summer hours, which start this week. 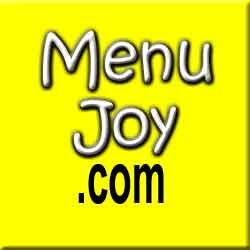 Don't forget to visit our friends at MenuJoy.com for area restaurant menus.